The LVT-3 was developed by the Borg Warner Corporation as their Model B in April 1943. For the first time, the crew could disembark from a ramp at the rear, thus avoiding fire from the enemy. For this, two Cadillac engines were incorporated in the design, placed in the sponsons and connected trough a hydramatic transmission to a final drive in the front of the vehicle. These were the same engines and transmission as those on the M5 Stuart. The transmission had four forward and one reverse speeds. On landing, the transmission was shifted automatically to a multiple speed land gearbox mode. At sea, it was limited to the first and second gear. The rear ramp was hydraulically operated. The cargo bay was deep, large enough to accommodate a Jeep and an entire company, or 4 tons of cargo. The gunners had a step to operate their heavy machine-guns, located between the cargo compartment and the crew cabin. The latter was nearer to the bow than on other LVTs. The driver sat in the middle, with the co-driver on his right. They were protected by five bulletproof glass windows giving an excellent peripheral view. The track links of the Bushmaster were of a rubber bush type, while the usual ones had a dry pin type. Each track had 103 track segments per side, 12 in (30.4 cm) wide. Appliqué armor could be added, raising the weight and decreasing the cargo capacity to 1.3 tons (2900 lbs). 2962 were built between 1943 and 1945 by Ingersoll and Graham-Paige. In 1949, an armored roof was fitted over the cargo bay and the bow was extended to improve buoyancy. The armament included two .30 (7.62 mm) machine-guns in turrets and another one at the bow, in a ball mount. 1200 were converted to this LVT-3C standard by the Long Beach Naval Shipyard. The split aluminum cargo cover could be folded out of the way on top of either sponson. Escape hatches were fitted and side armor added. The overall weight was now about 6000 lbs (2700 kg) more than on the LVT-3. The first known use of the Bushmaster was in Okinawa in April 1945. Before that, they were most likely stockpiled or used for training. 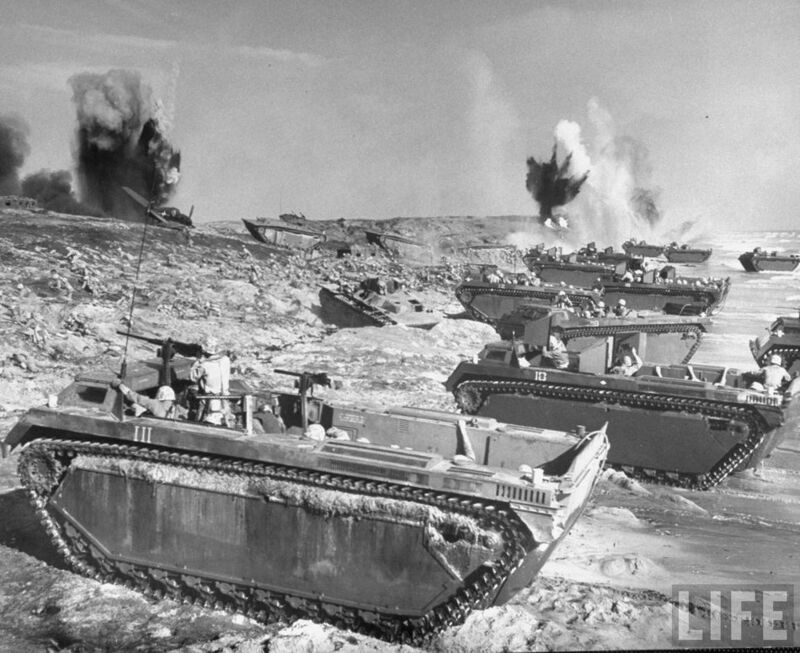 LVT-3Cs took part in the Korean war, landing at Inchon in September 1950. A regular US Army LVT-3 Bushmaster, with its ramp down, in 1944. US Marine Corps LVT-3 at Okinawa 1945. A former LVT-3C now part of a private collection, painted and overhauled, now exhibited during public displays.